Burros – Let's Go RVing! What a fun way to start a day. Campground checkout was 11:00 and there were still a few things we wanted to see so we were up and out before 8:00 this morning (I know – a record for us.). Last night we had discussed what we wanted to do and although there was one trail left that we had not hiked we elected instead to go on the scenic road where we could climb over those beautiful rocks we had seen yesterday for an hour. Our first stop was Atlatl Rock. We climbed up the metal staircase to the top and were surprised to see a wall of petroglyphs. 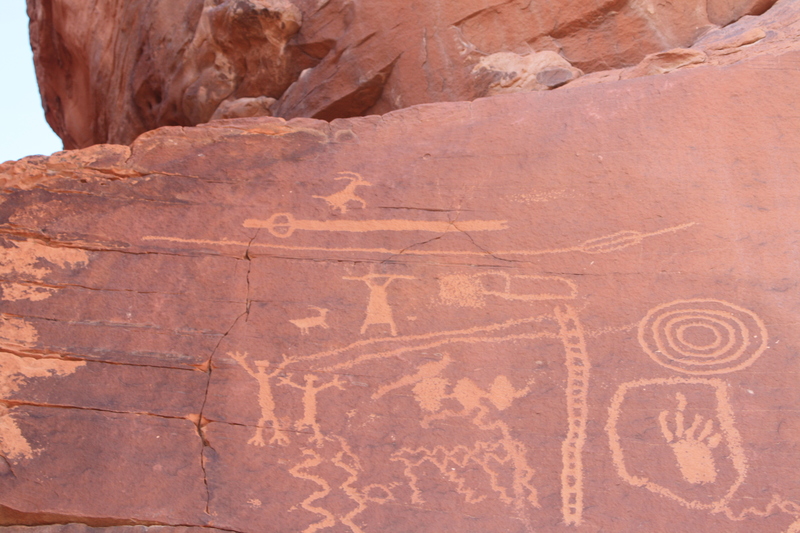 At the top of the etchings was a petroglyph of a primitive weapon, an Atlatl, a short spear that attached by a notch to a throwing stick and was the precursor to the bow and arrow. 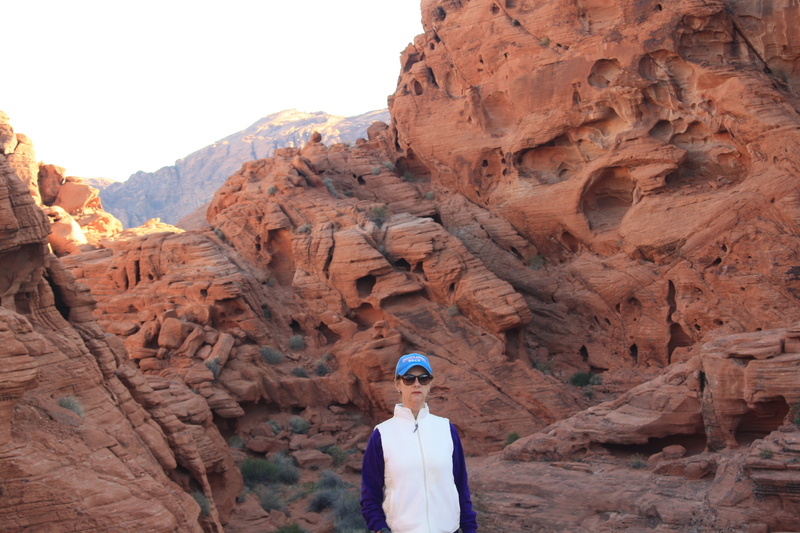 Sadly among the petroglyphs were some names carved in the rock. For the life of me I cannot understand the mindset that would damage such antiquity. Our next stop was the Arch Rock, a simple arch at the top of the rock. After a couple of pictures we headed on to our destination, the beautiful accessible rocks. 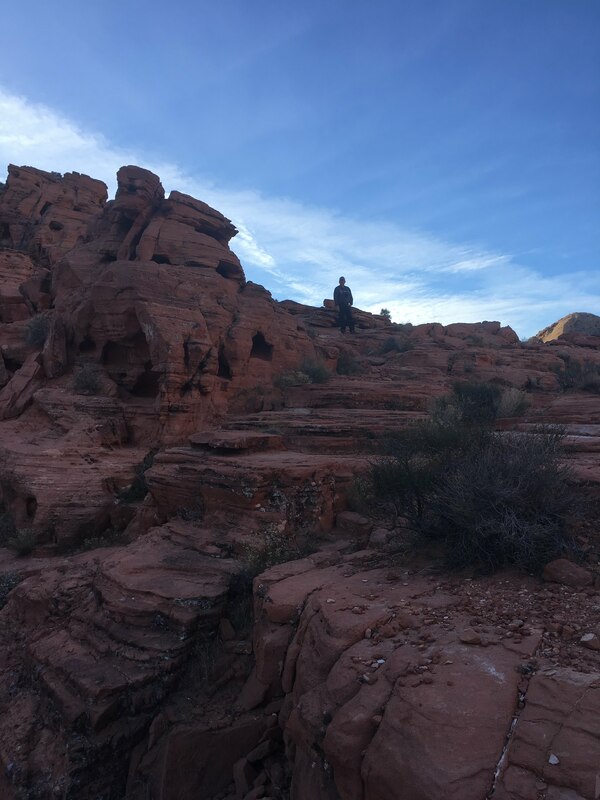 We had such fun climbing up and down, over and under the beautiful red rock, no trails to follow, just wandering around in and out of the nooks and cranies. I saw a fairly large area of matted grass indicating that it was a bedding area for probably the big horn sheep. One other person briefly tried the rocks while we were there and asked some questions about the park. As we had been there two days we did have some recommendations. As he left he said he had just seen some big horn sheep but alas, we never saw them. Back to the coach, showers, dressed, slides in, jacks up and we were leaving the campground at 9.59. We stopped at some level ground and hitched the car and were leaving Valley of Fire State Park by 10:06. Sometimes it works! A brief stop at the local gas station for gas and we were on our way to Needles, California our 26h state. Driving through Las Vegas (I-15 is only a block away from the strip) was nerve racking. Again, Jerry did a tremendous job while I looked down. I can drive our coach and do occasionally but if I had to drive through a city we’d be in real trouble! Check in at Needles KOA was quick and easy. After a quick lunch we were on our way to Oatman, Arizona, an iconic stop on Route 66. As we entered the small town we were immediately stopped by several burros. Yes, wild burros wander the street and seem to be pretty prolific. They freely roam the town streets and can be hand-fed hay cubes otherwise known as “burro chow,” readily available in practically every store in town. We were told not to feed the babies as they are still nursing – you can tell them apart because they have a white dot on their foreheads. Though normally gentle, the burros are in fact wild and signs posted throughout Oatman advise visitors to exercise caution. We were told that they were friendly but would grab food out of your hand. We stopped and got some ice cream but made sure we ate it all before we went outside. The burros are descended from pack animals turned loose by early prospectors, and are protected by the U.S. Department of the Interior. No one seemed to know how many there were. The other amazing site was the combination ice cream shop, bar and restaurant, the Oatman Hotel (and Dollar Bill Bar), which was built back in 1902 just before the final major gold rush. The two-story hotel is one of America’s most famous historic landmarks. A modest structure, built of adobe, it gained fame when the world’s most famous movie star at the time chose it as his honeymoon destination. Clark Gable and Carole Lombard were the Hollywood golden couple and after a wedding in Kingman, AZ Gable and Lombard checked into the Oatman Hotel. Gable was a big fan of poker, and it’s said he loved the town and became friends with the miners. Today you can visit the “Gable/Lombard Honeymoon Suite” although it was closed when we were there. 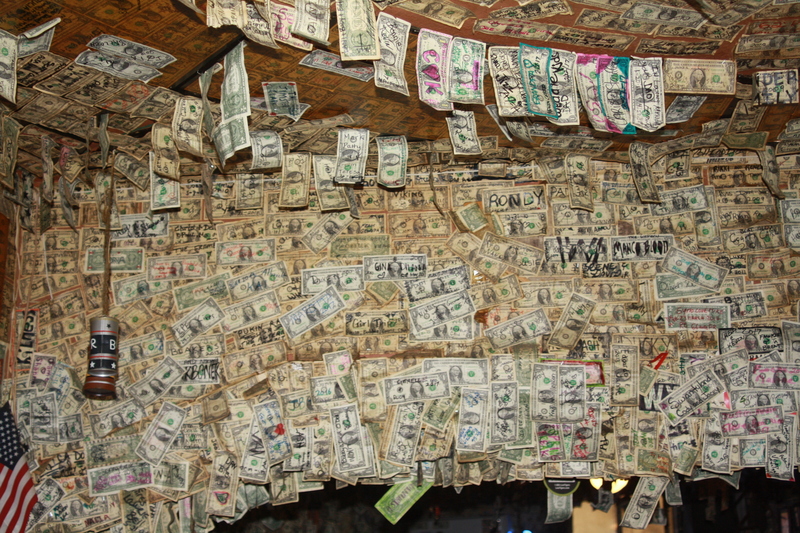 The walls of the bar and restaurant are covered in one dollar bills. They were everywhere and we were told there was probably about $140,000 on the walls and doors. Jerry got out a dollar bill, signed it and stapled it to the door. The waitress said there was one $50 bill and two $100 bills but they were hidden under other bills. Apparently the custom started when miners would come in for a drink after getting paid. They would present a dollar and then charge on that dollar for the nickel drinks. Both Jerry and I asked about insurance on the building because if there was a fire it would be a colossal loss. 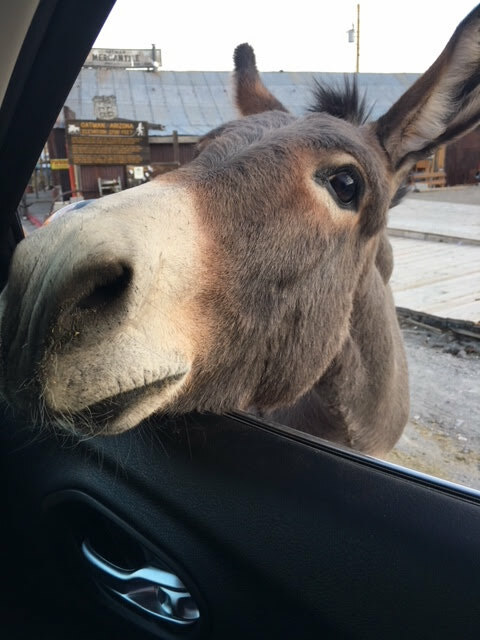 As we were driving away the donkeys kept coming up to us even sticking their heads in the car. Yikes! It was a little daunting but I just laughed out loud and kept on laughing. There were fewer in town when we left and we were told that they returned to the mountains to bed down for the night. It was amazing – I think I walked around with my mouth agape the entire time I was there. We headed out to Walmart for some much needed grocery shopping and then to the campground where we watched the State of the Union address and I worked on bringing the blog up to date.